About Architectural Railings & Grilles, Inc. Architectural Railings & Grilles, Inc. provides stainless steel, stainless steel & glass, and finished aluminum railings for commercial projects. We employ a team of highly qualified sales staff, project managers, engineers, fabricators, and installers, who have been designing, crafting and installing beautiful, high-quality commercial railings for more than 25 years. 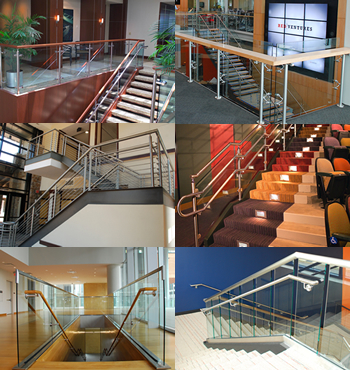 With 22 proprietary modular railing system designs and custom capabilities, we are sure to have a railing system to complement your next commercial building project! Company Information from Architectural Railings & Grilles, Inc.
Products from Architectural Railings & Grilles, Inc.
Modular Railings Our modular railings may be used in their own standard design, or customized to accommodate the specific design requirements of our clients. Summit (NEW) Summit offers a distinctive appearance via use of stainless steel flatbar posts. The standard Summit design bears a stainless top cap and grip rail, and overlapping glass infill panels. Hamilton (NEW) Hamilton offers flexibility in that it can accomodate a wood or stainless steel top cap; or no top cap at all. Hamilton comes standard with a 1.5" stainless steel grip rail, and offers a unique design via "spider clip" glass mounts. Monaco (NEW) Monaco utilizes round or square glass clamps in lieu of glass buttons, as seen on our Southpark railing. Mayfair (NEW) Mayfair offers flexibility in that it can accomodate a wood or stainless steel top cap; or no top cap at all. Mayfair comes standard with a 1.5" stainless steel grip rail. Kensington (NEW) Kensington offers flexibility in that it can accomodate a wood or stainless steel top cap; or no top cap at all. Kensington comes standard with a 1.5" stainless steel grip rail. Tivoli (NEW) Tivoli is our first modular structural glass railing. Tivoli comes standard with a 1.5" stainless steel grip, a 2.5" stainless steel top cap, and stainless cladding. This railing design may also be installed without a top cap. Request for Information / Request a Catalog from Architectural Railings & Grilles, Inc.
To request more information from Architectural Railings & Grilles, Inc., please complete the form below. For other relevant searches, you might want to try: handrails, railings, handrail, railing, stainless steel handrails, stainless steel railings, stainless steel handrail, stainless steel railing, stainless handrails, stainless railings, stainless handrail, stainless railing, modular railings. Copyright © 1996–2019 AECinfo.com  Company presentation: information, news and documentation about Architectural Railings & Grilles, Inc..